Why do they need to remove them? Because our society emphasizes straight and beautiful smiles. There is often times not adequate room in the mouth for our wisdom teeth to erupt without creating overcrowding. This is especially true if you have already gone through orthodontics to achieve that perfect smile. What can happen if I don’t remove my them? Aside from the cosmetic repercussions mentioned earlier. Overcrowding can prevent the wisdom tooth from having enough room to erupt, thus becoming impacted. 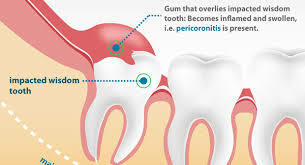 An impacted tooth can be very painful and can lead to very serious infection. Some issues wisdom teeth can cause might not be seen by the naked eye because the tooth has not erupted yet. A wisdom tooth’s roots get longer as it ages making extraction more difficult, increasing the potential for complications such as nerve damage. Depending on the nature of your case, wisdom tooth extractions are performed under local anesthesia, intravenous sedation, or general anesthesia. Our doctors will speak to you before the surgery and answer any questions you have. After surgery it is common to experience swelling and mild discomfort.